The term “ghost town,” is a generic term which originated in the early twentieth or late nineteenth century, although the concept of differentiating between an extant and abandoned location dates beck into the seventeenth century. While ghost towns are found on every continent, including Antarctica and the Antarctic islands, the United States boasts the greatest number of ghost towns of all the existent countries. Several reasons exist for this distinction. Foremost, the landmass of the United States is greater than most other countries excepting Russia and Canada, which supports a geographic predisposition for settlement numeracy and variance. Secondly, related to its vastness in the days of the past, greater numbers of settlements were necessary to transmit people and information. The United States also has a more temperate climate allowing for concentrated settlement in nearly every corner, as opposed to Russia and Canada whom see limited settlement within the tundra and arctic zones. Abandoned settlements abound in every conceivable form within the United States and are deeply embedded in collective history and folklore . Some of the earliest colonial settlements became ghost towns, most notably Roanoke Colony in North Carolina. Jamestown too–the first permanent English settlement was abandoned after Williamsburg was made the capitol of Virginia. In the early days of the colonies, disease, starvation, and the occasional battle with Indigenous Americans decimated more than a few villages. However. many of the early prominent “ghost towns,” were originally found in the aftermath of land speculations—particularly in places promising valuable commodities—gold, silver, and later coal. Locations close to the water were initially the most successful–especially if a mill or ferry were added. Later, railroads brought life to some places, while taking it from others. When the railroads were replaced by highways, the growth changed again. Progress and industrialization it seems are far more often than not, the contributing predatory influence. The loss of many small town employers further contributes to the decline of rural and some urban communities. The National Park Service defines a ghost town as “a once thriving town that has been completely abandoned.” The phrase “once thriving,” is rather open to interpretation however, and the caveat “completely abandoned,” is almost always ignored. In Iowa, as in most places the term is often subjectively applied to a wide variety of places, ranging from the completely obsolete to the fully extant but in disrepair. It seems that the term is highly ambiguous and even occasionally used as a pejorative to describe communities in decline. Class E: Busy historic community. One can quickly see the limitations of this scale. We do not know any real information based on this classification except what might still be there. Note that it doesn’t take into communities where perhaps only a cemetery or church remain. How about former sites that are marked by a sign? What really is a “busy historic community.” If it is busy, can it really be considered a ghost town? What about incorporated towns that are no longer “busy,” or incorporated towns that have no extant businesses or business buildings? In the context of Iowa, we can easily detect formidable problems: Red Rock in Marion County could be a “F” as it is within a state park and still has a cemetery attached to it. The townsite itself is clearly an “A” however. 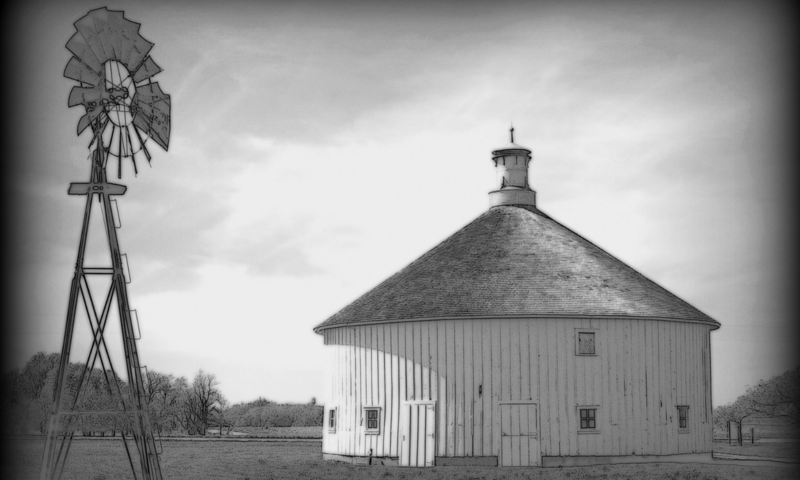 Living History Farms’ Walnut Hill could be considered a class F except that it was never a real town—merely a part of Urbandale (but perhaps that makes it a “G”). Then there’s Jasper County’s Greencastle—clearly a H with no original buildings, yet it still has an unofficial population and several newer farm houses on the original site. Donnan in Fayette County is an “A” except for a sign and a small picnic area, but it was once incorporated. How does that contrast to Guthrie County’s Herndon which is also marked by a sign but was never incorporated. Both of these differ from Clyde near the Marshall and Jasper County line which was platted and filed but never incorporated and absolutely nothing remains—not even a sign (class “A” for sure). Zook Spur on the Polk and Dallas County line is a “D” but it was never platted and was mostly informal. Should it be counted at all? Type A: A completely barren site with no remnants remaining to suggest a town, community, or village of any type ever existed here. Type B: A site of rubble and roofless buildings remaining with no obvious population or a location marked with only a sign noting that something once existed. Type C: A Cemetery (may or may not have a sign, and may or may not share the same name of the community), church, creamery, bridge, mill, fort or other civic indicator remains to mark where a town, or village existed. These can be representative of a township so long as it is no further than one mile from the site. Type D: A semi-abandoned community. Site may have a few residences but all commercial and industrial buildings are abandoned. Type E: A historic Community. Site may have some residences and fewer than ten commercial and industrial buildings that are in use. Type F: A restored, fabricated, or semi-dilapidated community maintained as an attraction or within a park. Type G: Integrated Community: The site was either annexed into neighboring community or is presently a location where new homes or buildings occupy the site of a former town. Group 5: An informal community created on or centered around private land. May or may not have been subdivided into lots. If we use the same examples as above, we can quickly identify Red Rock, Iowa as a C2 ghost town–having been platted but never incorporated and with remnants of a cemetery indicating where the community once was located. Greencastle in Jasper County has the unusual ability to be both a C and a G together making it a CG2. Donnan is now a B1–having only a sign but being at one time an incorporated city while Herndon is a B2 as it was not incorporated. Clyde is now a A2 having no remnants, and the mining town of Zook Spur is a B3. While this system is imperfect and still vulnerable to flaws, I believe it offers a better standard for identifying and classifying our disappearing historical communities. It have endeavored to mark every site on the main map to represent the type of ghost town that I saw upon my visit. Knowing that people as well as the elements can affect these places by damaging remaining buildings and markers, I welcome feedback if you feel a site is inaccurately characterized.